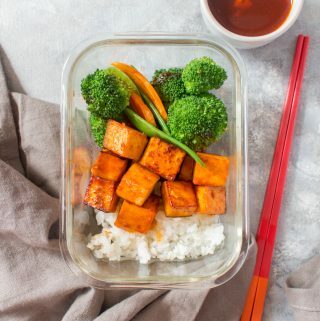 This Korean Spicy Tofu Meal Prep is going knock your socks off. 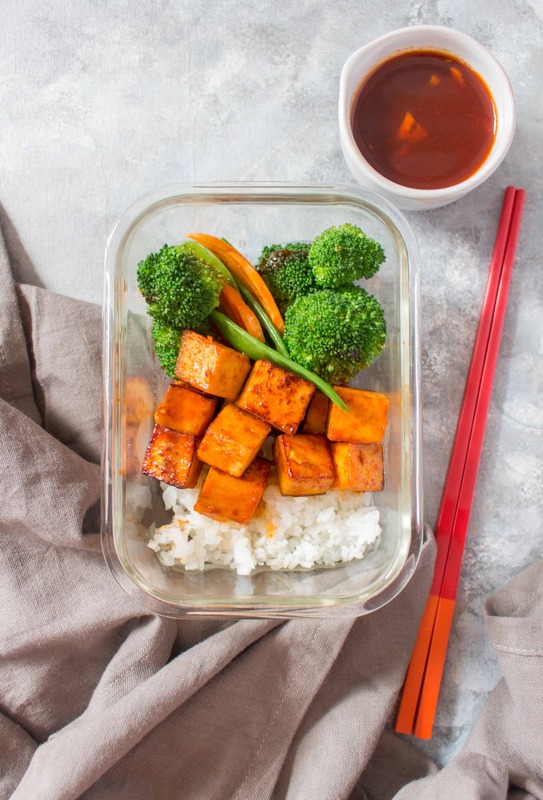 A perfect balance of heat and sweet, you won’t even notice this meal prep is tofu! Your eyes are not deceiving you! A tofu recipe?! Yup, a tofu recipe. I don’t usually do a lot of tofu recipes on the blog as H isn’t a huge fan of tofu like this but hey, H is has been gone for work so I’m meal prepping whatever I feel like haha. 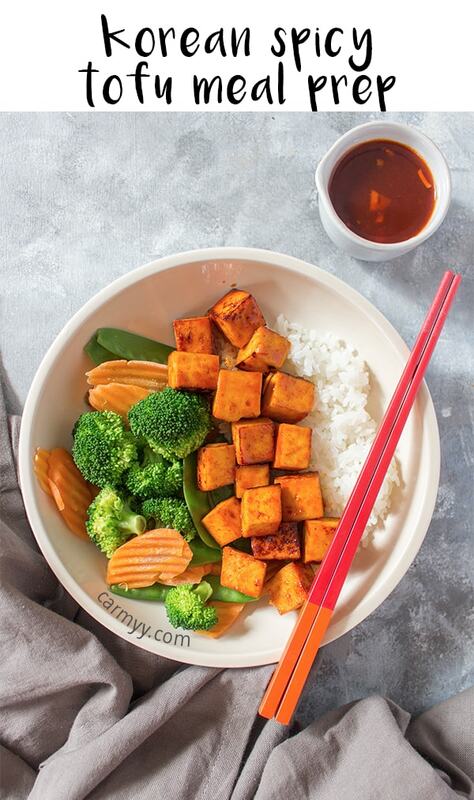 Anyways, today I’m sharing with you this delicious Korean Spicy Tofu Meal Prep! If you had purchased some Gochujang to try my previous Korean inspired recipes and still have some leftover, this is a yummy way to use it up. This recipe takes minutes to throw together (not including pressing the tofu) and has a strong kick to it. The spicy sauce that coats the tofu goes well with other proteins as well so if you’re not a fan of tofu, you can pan fry up some chicken cubes if you’d like to substitute it for the tofu. To start off this recipe, you’ll need to have pressed your extra-firm tofu. I sliced my tofu length-wise and then laid it on top of a paper towel on a small sheet pan. Then I put another piece of paper towel on top, then a small cutting board with 2 heavy cans on top of that. Make sure your tofu has been pressed for a minimum of 30 minutes. Once done, I cut them into cubes. In a small saucepan, combine your rice wine vinegar, soy sauce, Gouchujang, honey, and diced garlic. Bring it up to a boil and it set it aside. 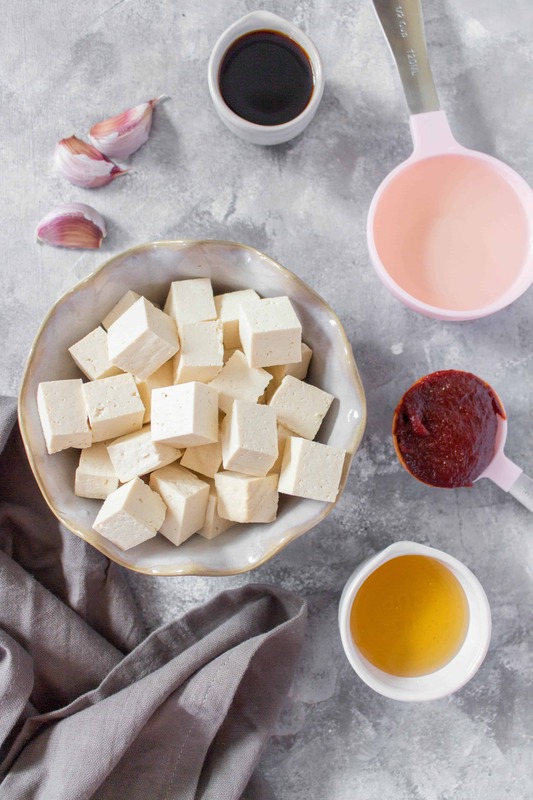 In a hot frying pan with a bit of oil, “fry” your tofu cubes. Once they’ve gotten some colour on them, pour in half your sauce on top of your tofu cubes. Cook for 2-3 minutes, making sure the tofu are evenly coated. Optional: you can remove the tofu from the pan and quickly stir-fry your vegetables of choice. Once done, serve with your choice of vegetable and grain. Drizzle the leftover sauce on top of the bowl once you’re ready to eat! You might be tempted to skip the pressing of the tofu if you purchased the extra firm pack (I mean, that’s the whole point of it being extra firm right?!) 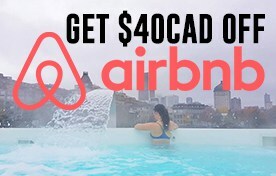 but I really don’t recommend skipping it! Because the tofu is package with liquid, it needs to be pressed out before you cook it. If you skip pressing the tofu, it could add extra water to the pan so it won’t brown and/or fall apart. If you want super crispy tofu, you can lightly coat your tofu with cornstarch before frying. Because this is tofu, you don’t have to worry about it not cooking through, you can brown/cook until it is the golden shade you desire. 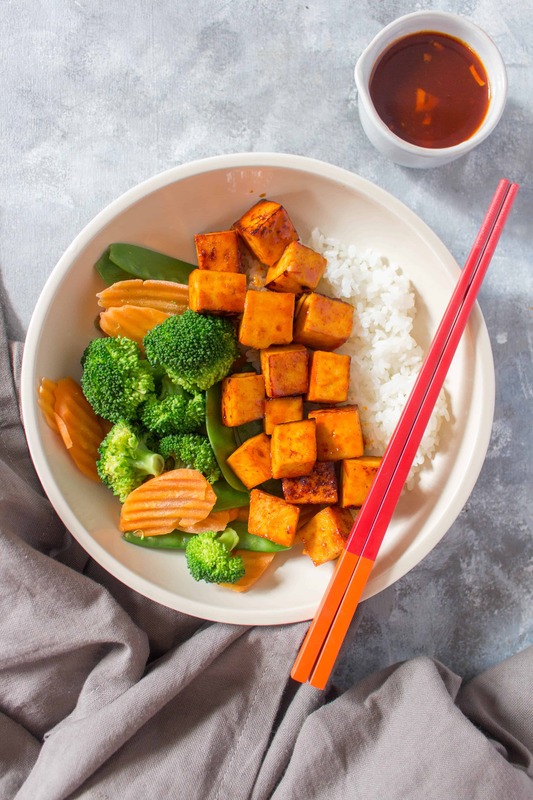 Other methods of cooking the tofu for this recipe is baking, broiling, or grilling! I used these glass containers I found on sale at Walmart to store my meal prep! Need help meal prepping? 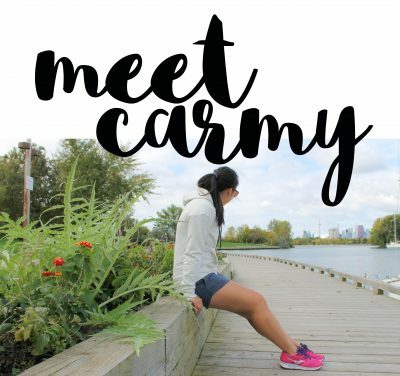 Check out my Meal Prep: Learning the Basics e-book! To start off this recipe, you’ll need to have pressed your extra-firm tofu. See the notes in the blog post for detailed instructions.